I normally use natural oils directly on my skin or my usual products, which I discussed in my skincare arsenal article. However, once in a while, I come across a gem that deserves to be added into the mix and this week, the gem is Christina Moss Naturals Organic Facial Moisturizer. The moisturizer is advertised as organic and all natural, which a lot of moisturizers do but when you look closely at their ingredient listing, you find the claims to be untrue. Christina Moss Naturals Facial Moisturizer contains 100% certified organic natural ingredients; mostly some of the best natural oils. Christina Moss Naturals Facial Moisturizer is non-comedogenic. I have oily/combination acne prone skin so need to be careful that what I apply on my face doesn’t have the tendency to block pores. Some of the ingredients contained in Christina Moss Naturals Facial Moisturizer makes skin softer and more supple. 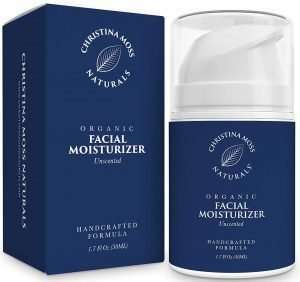 Christina Moss Naturals Facial Moisturizer is hypoallergenic and suitable for use with all skin types. 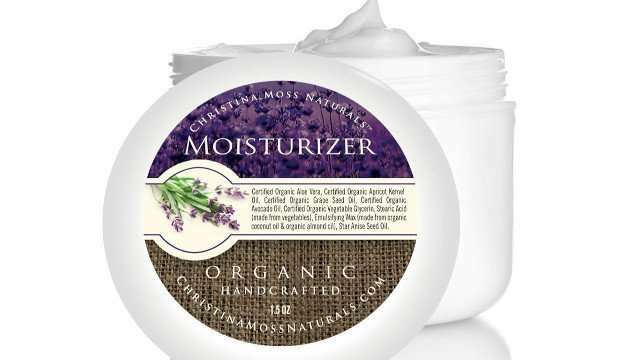 Christina Moss Naturals Facial Moisturizer is non-greasy and doesn’t leave any residue on the skin at all. 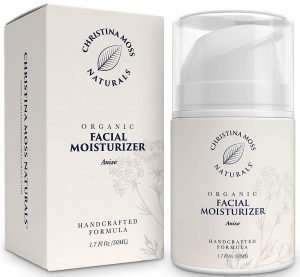 Christina Moss Naturals Facial Moisturizer is free of the usual suspects like propylene glycol (PG), propylene glycol derivatives (PGD), parabens and synthetic fragrances or preservatives. 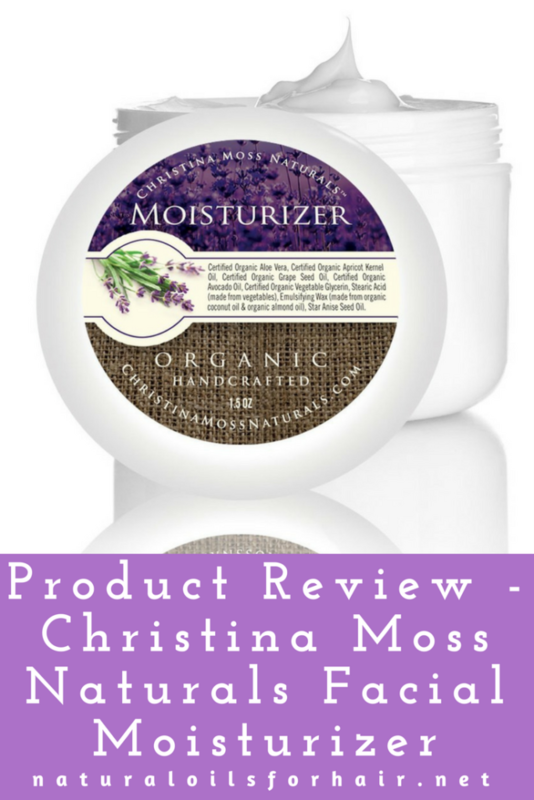 The Christina Moss Naturals Facial Moisturizer is a white creamy texture that feels like whipped mousse. The licorice scent is pleasant and mild without being overpowering. The scent dissipates within a few minutes of application making it suitable for people who don’t like heavily scented products. I use this moisturizer for 48 hours after any chemical peeling treatment at home. My usual moisturizer is a bit expensive and sometimes I can’t always afford it. Christina Moss Naturals Facial Moisturizer is a great budget-friendly go to for those kinds of days. It’s gentle enough to hydrate and moisturize my sensitive skin and help it to heal without causing any irritation. For maximum effects, I apply a vitamin C serum post peel like TruSkin Naturals Vitamin C Serum, wait 5 minutes then apply this on top. Certified organic aloe vera, certified organic apricot kernel oil, certified organic grapeseed oil, certified organic avocado oil, certified organic vegetable glycerine, organic star anise seed oil, emulsifying wax (made from organic coconut oil and organic almond oil) & stearic acid (a safe fatty acid). As you can see, nary a chemical component in sight. My skin loves grapeseed oil and avocado oil, which is part of what prompted me to try this product and I wasn’t disappointed. Apricot kernel oil is excellent for nourishment while aloe vera helps with acne and hydration. The star anise seed oil acts as a preservative and is what gives the products its mild scent. If you’re looking for a gentle and natural moisturizer, Christina Moss Naturals Organic Facial Moisturizer is the way to go. It comes in a 1.5oz container and a little goes a long way so expect it to last for a while. I definitely rate the Christina Moss Naturals Organic Facial Moisturizer 5/5. Christina Moss recommends storing it in the fridge but I keep it in a cool dry place and it still works fine. Since it’s natural, the shelf life is only 6 – 8 months but I don’t expect a jar to last that long anyway before a replacement is required. Did you know you can get all the products in the facial care range with free two-day shipping on Amazon Prime? Find out more about Amazon Prime HERE.